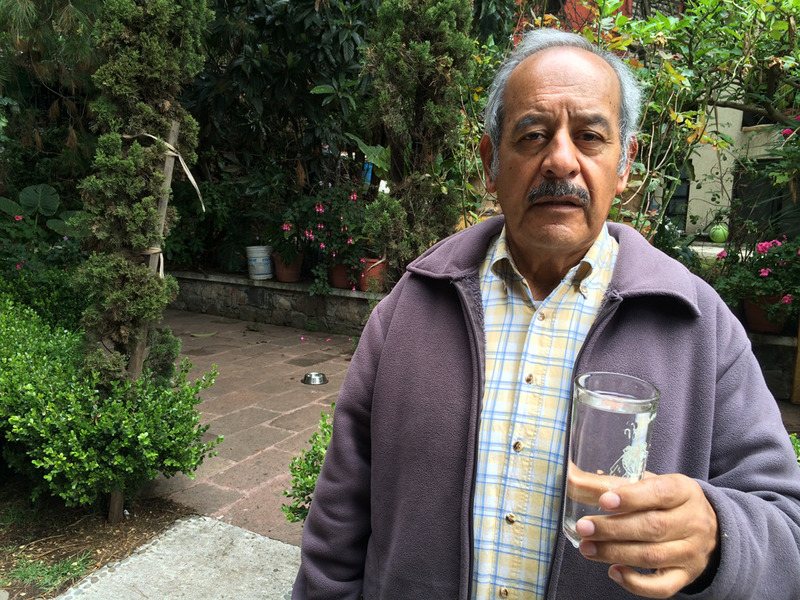 Filling a glass from his garden faucet, Juan Ramírez held the swirling water up to the intense Mexican sun. Satisfied with its purity, he touched his glass gently against my own. “Your health,” he toasted, before drinking it down in one gulp. Mexico City’s reservoirs consistently rank amongst the most contaminated supplies to any world capital. Drinking from the tap here is simply not recommended. Ramírez’s water, however, comes directly from a volcanic spring in San Bartolo Ameyalco, an otherwise impoverished town on the hilly southwestern outskirts of Mexico City, in the borough called Alvaro Obregon. Ramírez is leader of a group in San Bartolo Ameyalco intent on keeping their water supply local. Last Wednesday, Ramírez along with approximately two thousand other residents of Ameyalco attacked a police force of fifteen hundred riot officers who were guarding the final construction stage of a pipeline that will connect the town’s volcanic spring to Santa Fe, one of the most affluent districts of the Mexican capital. In videos posted online, San Bartolo residents are seen violently pummeling an officer in riot gear who had fallen to the ground. The residents beat back both police and pipeline engineers, leaving at least 100 police officers injured, 20 seriously. Residents said dozens were injured on their side, and authorities arrested five people. Mexico City’s government warned that more arrests would come. While the battle of the morning of May 21 was won by the residents of San Bartolo Ameyalco, what the locals now popularly call the ‘Water War’ is sure to be long and tense. Mexico City’s government sees the international business-aimed satellite city of Santa Fe, a high-end urbanization zone rapidly built upon a dumping ground with no prior water infrastructure, as a pillar of the local and even national economy. Although the details of the plan remain murky, San Bartolo Ameyalco residents are rightly suspicious of any scheme to divert their pure water to the international corporate offices nearby. Ameyalco, meaning “place where the water spouts” in Nahuatl, was engulfed by Mexico City’s urban sprawl in the 1950s. Its spring produces 60 liters of pure water every second, an amount which runs thin for the 35,000 people who depend on it. The narrow streets still channel the smells of pine sap and cooking tortillas on the cold mountain air. Neighbors chat in the marketplace about past victories and future strategies and children kick soccer balls against the main square’s murals of the village’s prized spring. Mexico City has serious problems with water shortages. One in three homes has no access to running water, forcing them to depend heavily upon water trucks called pipas, which refill homes’ water tanks at exorbitant prices. Seventy-four per cent of the capital’s water is pumped from underground, causing the city itself to sink. Leonel Luna, delegate of the Alvaro Obregon borough, has stated the spring is to be redirected to serve other towns in the area. Luna claims opposition to the project has been funded by the same businessmen who sell water from pipas, and who don’t want to lose their customer base if more running water is made available to other towns. Since the government’s announcement in April 2013 that the spring would be connected to a wider network covering the borough, residents of San Bartolo set up camp beside their main supply tank to defend their precious resource. The project to tap the San Bartolo spring for wider use has been in the works for almost two decades, though, authorities note. On May 21, the town’s church bells sounded out across the hillside to announce the authorities’ arrival. The residents responded to the signal by hurling rocks in the narrow streets, launching fireworks at the police line from windows and destroying plumbing equipment. In the town’s last functioning public laundry, where a communal pool is flanked by washbasins, Laura Hernández wrung the last of the soap from her son’s soccer jersey. She had managed to wash her entire family’s clothes using the single bucket of water she had rationed herself. Others say San Bartolo is being selfish with its resource. Leaders of the movement, however, said they are not budging. A series of marches are planned for the coming weeks. In recent days, members of various related or completely unrelated social movements in the Mexico City metropolitan region have sent messages of support to San Bartolo, signaling a wider fight in the public political sphere in Mexico related to the spring.